First session, first fish and he's cracked it, a Wye double, a spawned out solid 10lb 5½oz barbel - and people call me lucky! It's not his first double but it's the only one he's weighed and is therefore his official personal best. Top fishing that man! Probably best to skip the rest of the barbel season and move straight on to cracking the 30lb pike! 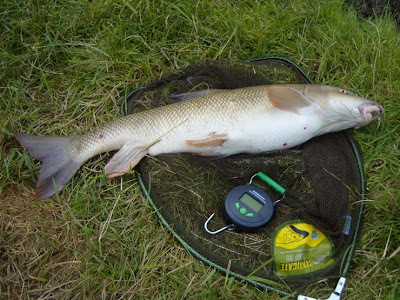 When I was fishing on the opening morning I saw James (My Fishing Exploits) catch a nice 4lb chub, from which he extracted the remains of a recently eaten mouse - I'll leave the gruesome details to his blog.